Every now and then someone tries something I’ve baked and finds it so good that they ask me to make it and they’ll pay me for it. This is one of those recipes. Earlier today we had a huge Thanksgiving lunch at work, and when the sign up sheet went around last week, I of course knew I had to make a dessert. (Trust me, you don’t want me cooking for you.) 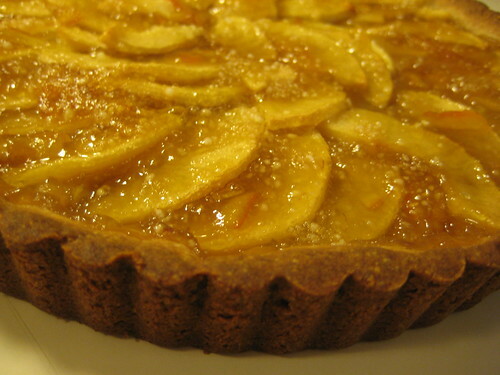 I hate anything pumpkin related, so when I saw this recipe for an apple brown sugar tart, I was smitten. As you know by now, I love anything with brown sugar. This did not disappointment. In a cake or pie pan, toast ½ cup (2 oz.) slivered almonds in a 350° oven until golden, shaking often, about 10 minutes. In a food processor or bowl, combine almonds, 1¼ cups all-purpose flour, and ¼ cup firmly packed light brown sugar. Add ½ cup (¼ lb.) butter, cut into pieces; whirl or rub with your fingers until fine crumbs form. Add 1 egg yolk; whirl or mix with a fork until dough sticks together. Pat into a ball. Press dough over bottom and up sides, flush with rim, of a 9- or 10-inch fluted tart pan with removable rim. Rinse apples and peel or leave skin on as desired. Core apples and cut into ¼-inch thick slices. In a bowl, gently mix apple slices with 2 tbsp. of the brown sugar, orange juice, and tapioca. Let rest 10 minutes to soften tapioca, then overlap slices neatly in unbaked tart shell. In a glass-measuring cup, combine remaining ¼ cup of the brown sugar and marmalade. Heat in a microwave at full power in 30-second intervals, stirring each time, until marmalade is melted. Evenly spread over apple slices. Bake in a 350° oven until crust is well browned and apples are tender when pierced, about 45 minutes (mine was done in about 40). Let tart cool on a rack at least 15 minutes. Serve warm or cool, cut into wedges, with ice cream if desired. tapicoa is a thickener. a lot of slow cooker recipes call for it to thicken sauces. how did it look weird? it should sort of disappear. And Rachel, see those white dots, that’s the tapioca…it didn’t disappear. Weird huh? sounds yummy. i’ll have to try this one….thanks! Next time, dissolve it in some liquid first. I don’t know why the directions didn’t have you do that. Sloppy recipe writing. @rachel – Ahh, will do. Thanks! It does look weird with the tapioca. I probably would have used pectin (or arrowroot), because I have a ton of it on hand. Just a tiny amount to gel it slightly, but I have never used tapioca for thickening. Heck, I’ve never even made tapioca pudding. YUM! This sounds amazing. I’ve been looking for an interesting apple-y dessert for thanksgiving… this might just fit the bill! This looks so delicious! And so perfect! It would be great for Thanksgiving! This looks beautiful and sounds delish.